My husband persuaded me to try DMC fitness and boy am I glad he did. He had to really talk me into it after we came back from holiday last year. We hadn’t held back on our hols and we were sick of the sight of ourselves. We were both overweight, tired and looked pretty terrible. Even before our holiday we’d been stuck in a cycle of over-eating and drinking for a good few years. Having previously been quite an active person, enjoying running and aerobics etc, I’d been struggling with a hip disorder that was making exercise difficult and dragging me down; work was extremely busy and stressful which gave me loads of excuses to abuse food and alcohol so I was just getting bigger and bigger and my hip worse and worse. 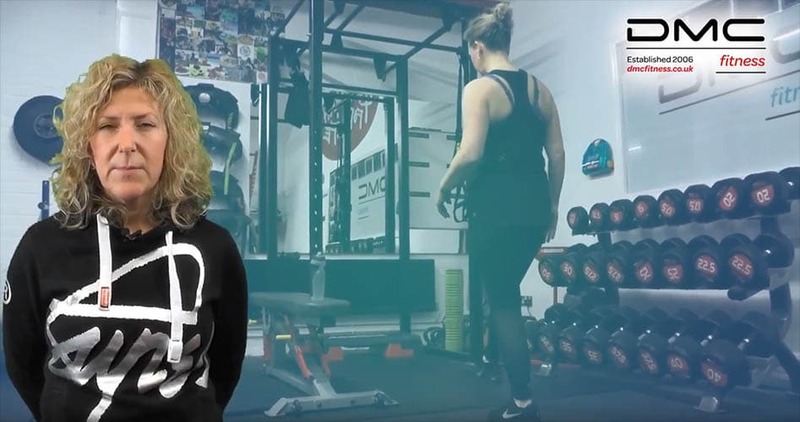 Neither of us could muster up the motivation to go to the gym so my husband Tom was searching online looking for other options one night and came across the DMC website, where he found a testimonial by a friend of his. He gave him a ring and had a good old chat and was assured he wouldn’t regret joining up with DMC. I took a lot more persuasion but finally agreed to go in with Tom for the induction. I met up with Davie and he took me through the whole DMC ethos, I explained my hip problems and what I wanted to achieve and he explained how Pablo, a coach with experience of training with people with hip and knee problems, could help me and I was inspired by him and his story as well as their approach to my personal fitness. I’d never experienced this level of care and interest at any other gym in my life. Tom and I both signed up on the spot for the Platinum programme and the rest, as they say, is history! I’ve been with DMC now since September 2016 so nearly a year. My original goals were to strengthen the muscles around my hip, to prolong the life of it until such times as I need a hip replacement. I also wanted to live a healthier lifestyle of eating well and drinking less so the fact DMC does the whole package was another real draw for me. On top of that I just wanted to get in shape and be happier and more confident with my body and mind. Since Sept 2016 Pablo has patiently worked with me in building my strength slowly and gradually and I’ve lost over a stone and a half! And I’m not finished yet! I’ve gone from a size 18 to a size 12 and I’m still losing weight and shaping up. In the first 12 weeks alone I lost a stone and 16.5 inches of fat. Since then I’ve lost more and my hip is so much stronger now that I’m even able to do split squats and lunges and all sorts of things I never thought I’d be able to do again! My eating habits have changed and I drink a lot less alcohol and I feel a lot happier. But DMC hasn’t just helped me physically, I’ve had a few Magic Mind sessions with Davie which was a whole other revelation; discovering things about myself mentally and emotionally and learning mechanisms to help me cope better with the stresses of my job that had been previously getting me down. The reasons I keep going back to DMC are pretty obvious from all of the above but the main thing is I really enjoy being in the gym with Pablo, Davie, Julie, Grant and Steven and the other clients. It’s not a big gym so you’re not surrounded by lots of other people mindlessly training with their headphones on. You’re engaged with your coach and the banter is awesome! Honestly, it’s hard work but it’s fun. The coaches all really care, they don’t judge and we have the crack. I train on a Saturday morning at 10am and it’s the perfect start to my weekend. My hip could probably last a lot longer now that it’s much stronger but I’m going to get the replacement early 2017 because I’m excited to see how much more I can do and how much fitter I can become when I’m totally pain free and unhindered. So I’ll keep going to DMC until I get my hip operation and then I’ll be back as soon as I’m on my feet and able and for as long as they will have me.